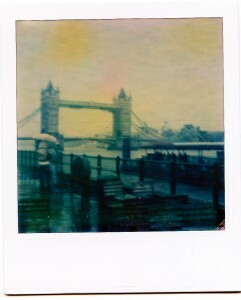 Impossible have recently released their very first batch of Colour Material called PX 70 Color Shade. This First Flush stock is currently available as a starter pack of 3x 8 shots for £34. At £1.40 per shot, that’s 70p cheaper than the £2.10 we’re currently paying for one PX 600 black and white picture. That’s great news! However, as is always the case with colour over black and white, there’s a LOT more happening chemically. Where the PX 100 and 600 materials already had to deal with 4 internal layers, the PX 70 new colour material has at least 15, maybe even more. Let’s see what the Impossible Team have cooked up for us. 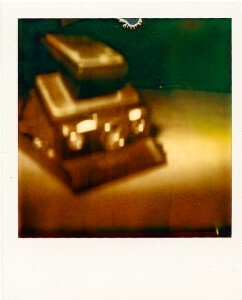 For this test, I’ve tried PX 70 in my new Golden SX-70. 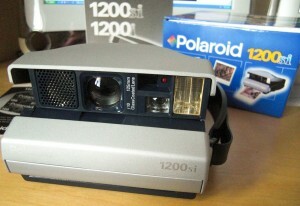 I bought yet another Polaroid camera on eBay: the Polaroid 1200si as part of the HealthCam Kit. It includes the camera, a Light Lock close-up attachment and a funky Polaroid carrying bag. The main difference between this camera and my other two Polaroids is the film format: the 1200si uses the wider Image/Spectra format instead of the square 600 pictures. I vaguely remember when the Spectra format came out, because I was thinking what a huge waste of time I thought it was. 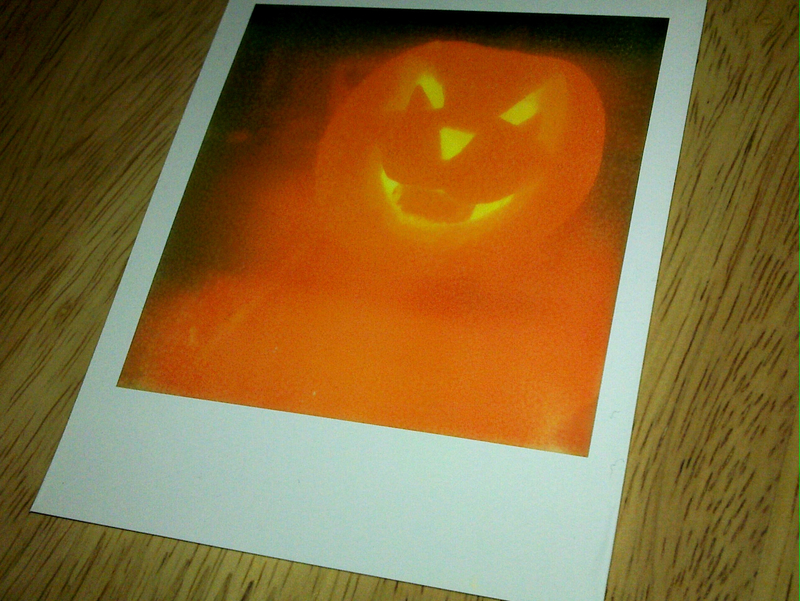 Polaroids are square – period. Several decades later I’m thinking differently. 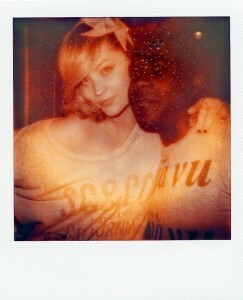 As a Newcomer Polaroid addict, still can’t explain my fascination with the medium, but I can certainly savour the moment. 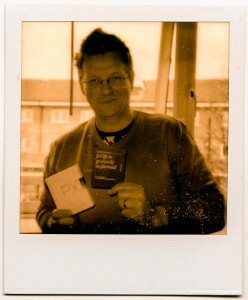 When the first batch of Impossible PX films were available I couldn’t wait to get my hands on them. That was about 4 months ago. I’m more than happy to support a project that will bring back instant photography and give those Polaroid cameras a new lease on life. and much more. What we as users (and Impossible) didn’t know was that those early pictures would DESTROY themselves after only a few months. Ever since Impossible Film came out, and especially after playing with Paul’s camera, I kept thinking that an SX70 would be a very nice addition to my collection. The trouble is that since Impossible Film came out, those cameras have gone through the roof on eBay – gone are the days when you could pick them up for a tenner. Every once in a while I do a quick sweep on eBay and see what’s on offer, usually disappointed about having to spend £100 or more, so I look over to my trusty Polaroid 600 I got for £2.50, the one that started my Polaroid Adventures Addiction. Much better I kept thinking. 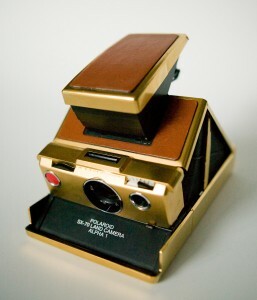 A little while ago I came across an auction for a GOLD PLATED Polaroid SX-70. Only 500 were ever made to celebrate the tremendous success of the Edwin Land’s integral film and the easiest instant picture ever: The iconic square Polaroid. Here’s a rare collector’s item that only comes up once in a blue moon. The more I thought about it, the more I became convinced that this auction was put there for me, and that I was meant to get this camera. Several months ago I spoke to Paul Weston about the new Impossible PX films and what a cool idea the Polaroid Rennaisance was. He happened to mention that he bought a vintage SX70 Land Camera from some bloke who used to shoot furniture with it – and the next thing I know is that he rbought it in for me to have a play. How exciting is that! Let’s have a look under hood of this goodie, which happens to be only 5 years younger than I am. Today is a very special day for various reasons: not only has my Polaroid 600 Extreme camera arrived (the one I bought for £2.50 off eBay). Also, both me and my wife are off together – it rarely happens these days. That alone was reason to celebrate. But more importantly: The Impossible Project have today released their brand new PX600 Silver Shade Instant Film which is made for just these cameras! I put an order for 12 packs in immediately and can’t wait to give it a try. In the meantime however, I pondered over the question “does the PX100 work in Polaroid 600 cameras” or rather “does an SX-70 film work in a Polaroid 600 camera” as discussed in my previous post. I’m happy to say that YES IT DOES – with a minor modofication to the camera. Let me show you the results and talk you through my experiences with this exciting new material. 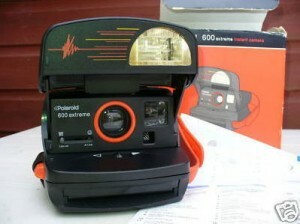 At the time of writing, I’m eagerly awaiting the arrival of my first ever Polaroid camera: the 600 Extreme that I got from eBay for a bargain price of £2.50. Hey, it even was for charity! I wanted it because there’s an ever so slim chance that I can use it with the brand new film by The Impossible Project: PX100 First Flush. It’s a black and white film that fits old Polaroid cameras and has only been released a couple of weeks ago. The Impossible Project, lead by Lomography founder Dr. Florian Kaps, have bought the last remaining Polaroid film factory in Enschede in 2008 and have since then been working on reviving this brilliant format. I cannot wait to see what they’ve come up with! Since Polaroid left about 300 million cameras stranded in drawers and attics around the world without fresh film coming onto the market, my fascination with a medium doomed to be extinct keeps growing daily. 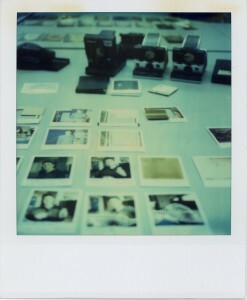 I never really cared for Polaroid in the past, mainly because of expensive running costs. The cameras aren’t exactly attractive either. However, my views on the subject have changed in recent years, and ever since I acquired an Instant Back for my Diana I don’t mind telling you that both Julia and I are ADDICTED to instant pictures!